Mehrling holds his CAB Presidents Award following the ceremony at Windows on the River in Cleveland’s Flats. 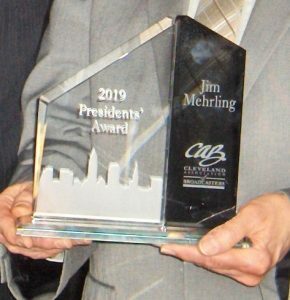 Jim Mehrling, the long-time host of WEOL-AM’s Scholastic Games High School Quiz program was honored today with a Presidents’ Award from the Cleveland Association of Broadcasters (CAB). 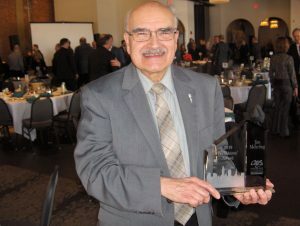 The presentation included description of his 50 years in radio production and programming, dating from his years as WEOL’s Chief Announcer in the 1970s, followed by 13 years at Cleveland’s News-Talk WERE, and twenty-five years at Cleveland’s classical music station, WCLV. He recounts some of his WEOL accomplishments as the most meaningful. During his years in Cleveland he created a high school quiz program which he thought would be a great addition to the airwaves in Lorain county. He returned to WEOL as a program producer in 1989 and with the support of WEOL and a generous grant from the Nordson Corporation, Scholastic Games was born. The program is poised to enter a thirtieth season next year.